“How do you know when the Sarrows is coming? This book was amazing and this series has just jumped right to the top of my favorites list! How do I even begin to review this book? I feel like a flailing idiot, running around in circles with these big heart eyes, throwing this book at people while shouting “READ THIS BOOK NOW!”. I just love it, okay? Please read this series if you haven’t yet. You will definitely not regret it! THESE CHARACTERS ARE THE BEST CHARACTERS IN THE HISTORY OF EVER. While A Darker Shade of Magic was more plot-driven, A Gathering of Shadows is more character-driven. Though we already got to know the characters in the previous book, this is the book that will turn your affection for them into full-blown love and obsession. I have fallen in love with every single character. Kell is just this amazing, sweet, snarky, contantly-frowning little cinammon roll who is suffering under the events and decisions he made in book one. He’s slowly going out of his mind and training like crazy so he’s even more badass. Not to mention, he’s an amazing brother. The brotherly love really is amazing. We get a lot more Rhy in this and it has made me so happy. Rhy is such a sassy, snarky little one and he shines in all his scenes, no matter which other characters he’s interacting with. Of course, he’s also suffering a lot due to previous events so it helps that we get his POV so we can understand him better. “What brings you to my room?” he asked, relief bleeding into annoyance. Lila is… well, she’s Lila. Our little thief with a dream of becoming a pirate is off doing her thing. Which of course means a lot of trouble and some pretty reckless choices, because that’s just who she is. I mean, she basically has her own theme song. That’s how awesome she is. And then there’s the new guy in town: Alucard. At first I wasn’t that interested in him, because I felt he was taking time away from the other characters. But eventually I warmed up to him and I considered him the perfect addition to the group. I loved his friendship / mentor thing he had going on with Lila. And I loved learning about his connection to Kell and Rhy and seeing how it all fit together and I can’t wait to learn more about what happened. A KICKASS MAGIC COMPETITION. Even though there is a LOT of focus on characters and character development, there are still some pretty awesome things going on plot-wise. One of those is the Essen Tach, which is this completely awesome magic competition that has duels between elemental magicians. So of course I adored everything about them. But there is still so much more going one behind the scenes and it is one hell of a ride! THIS WORLD! WE SEE MORE THAN JUST LONDON! The worldbuilding was already pretty much perfection with the different Londons and the travelling between them and the magic system. But now we get even more! We already kind of knew the country of Arnes, because it’s where Red London is, but because of the competition we also get to know the people of the neighbouring countries, Faro and Vesk. LILA’S NOT THE ONLY ONE WITH A SHIP OBSESSION. Okay, in A Darker Shade of Magic I did not ship anyone. Or better said, I kind of shipped everybody, because everybody had crazy chemistry with each other. But here? OMG, I never shipped two characters together that much when they didn’t even see each other for 85% of the book. Kell and Lila are each on their separate journey, but the other person is never far from their mind. They might deny it all they can, but they were constantly thinking of each other and it was adorable and made for one hell of a reunion. And they aren’t even the only ship that had me intrigued! OH MY GOD, THAT CLIFFHANGER! I was late to the party. I only read A Darker Shade of Magic mid this year and waited a few months to start A Gathering of Shadows, so I could make the wait for book three, A Conjuring of Light, a bit more bearable. BUT WHAT THE HELL WAS THAT ENDING? How am I supposed to wait another 3 months to find out what happens next? I mean, that ending was both genius and brutal and I NEED MORE! I can only imagine what the poor people who read this book when it came out and had to wait a whole year for answers have to go through. So, basically, I can’t recommend this series enough. Please excuse me while I resume my flailing and keep screaming at you to PLEASE READ THIS BOOK! It has amazing, fully-fleshed, morally grey characters, delicious worldbuilding, magic and intrigue. Have you read A Gathering of Shadows? What did you think about it? I am so intrigued about this series. Everyone seems to be loving it so much! I like to wait until at least three books are out so I can read them straight through. I really want to get to this series! It’s definitely right up my alley. Ooooh I REALLY need to read this one! I liked ADSOM, but I felt a little disconnected to the characters, so this could be JUST what I need! I may wait a couple weeks so that I don’t have to wait too long for A Conjuring of Light – especially if there is a cliffhanger 😉 Great review, you have made me much more excited to read this one!! 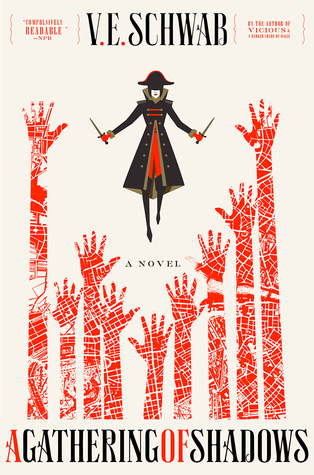 Oh if you’re hoping for a bigger connection with the characters, then I DEFINITELY recommend AGOS! It’s really character-driven and though I liked the characters in ADSOM, I really fell in love with them here <3 But yes, I think it's safe to wait a few more weeks, because that cliffhanger is brutal 😉 Hope you'll enjoy this! Okay seriously, this book needs to go to the top of my TBR pile now. Great review! Thanks! I’m just super excited about this series because I fell so much in love with it in this book <3 Hope you'll enjoy it!